In 2010, the median after-tax income of couple families with children with one household earner was $49,700 per year. If there were two earners in the family that income jumped to $79,400 per year. 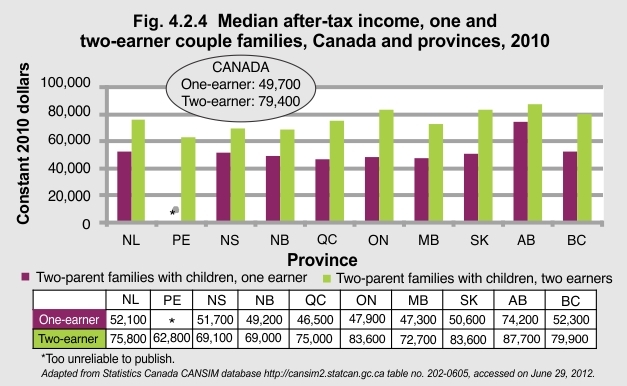 Children in two-parent families in Ontario, Saskatchewan, and Alberta had the highest family income with two earners, but Ontario has a bigger gap between one-earner and two-earner family incomes. Children in two-parent families in Prince Edward Island have a family income of $62,800 per year, 21% lower than the national average. Across the provinces, one-earner families in Quebec had the lowest after-tax income ($46,500) and Alberta had the highest with one-earner families making $74,200 per year, almost $30,000 per year more than Quebec.